Beer is a booming business in California with micro-brews popping up in small towns and big cities throughout the state. 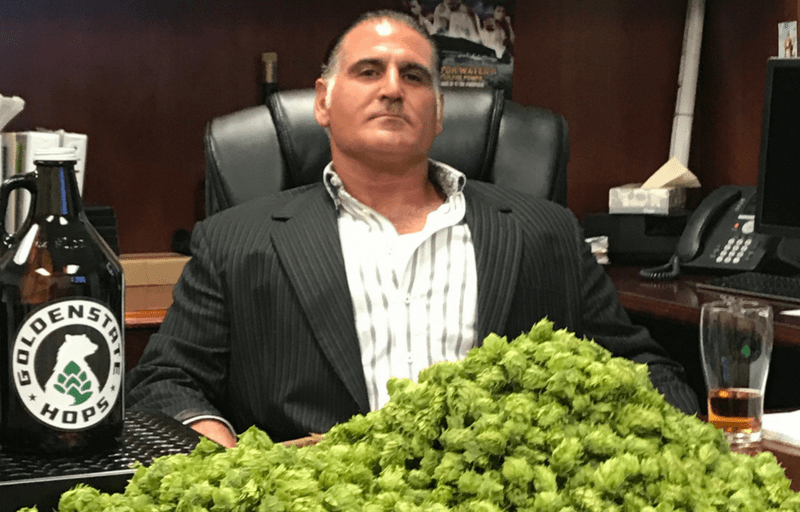 The desire to supply these local brewers with quality hops inspired Grant Parnagian to found Golden State Hops in 2017. With roots in agriculture (his family owns and operates Fowler Packing, a leader in grapes and citrus), Grant was able to use his formidable farming chops to grow some serious hops! Grant: The hops are coming close to harvest and so we are checking for ripeness. We are sending hops samples to a lab to test them for alpha and beta acids. We are also continuing to irrigate and monitor for pests, in order to keep the hops clean prior to harvest. The hops mature in the warm weather so that is being monitored closely. Grant: My favorite part is watching something grow, whether it’s from a plant or seed, and watching it bear fruit. The process of getting to the final product that consumers can enjoy is very satisfying. Grant: Our parent company, Fowler Packing, is a big contributor to the community food bank in Fresno and we also support and donate to Valley Children’s Hospital. We do various things within the community to help where there is a need. And we offer employees free on-site health care and offer free meals to employees through an on-site cafeteria. Grant: It’s been in our family ever since I was born. I grew up in the business and all our family has been involved in one capacity or another. I always enjoyed farming and being outside. When we went to college, our parents said we could pursue what we wanted, but we always had to work. During the time that I was in college, farming started to change with the onset of new technologies. It really sparked my interest to pursue farming and do more research and development. I researched hops for a few years and grew our first block a year ago. It’s almost like a science for us as we are trying different protocols. We have 10 acres of hops and 5 varieties. We grow 2 acres of each variety; centennial, cascade, chinook, magnum, and willamette. These are among the top 10 varieties that hops brewers use. We are the only commercial hop yard in California. Grant: I don’t have any hobbies as farming takes up most of my time. Whatever time I do have, I spend it with my family and my kids. Grant: You need to have a good work ethic. Farming can be demanding because you are working with a perishable product and timing is critical. Being able to make quick decisions and working long hours is part of the process. If someone is willing to work hard and put in the effort and get their boots dirty, farming is a wonderful profession. Working with Mother Nature, the water, the sun, and the land is very fulfilling. Grant: The main thing is water. Almost 99 percent of our acreage is on a drip system. We use moisture meters to monitor and determine when and if we need to water. We take steps to conserve water wherever we can. Our pumps run off of solar energy as another sustainable effort.